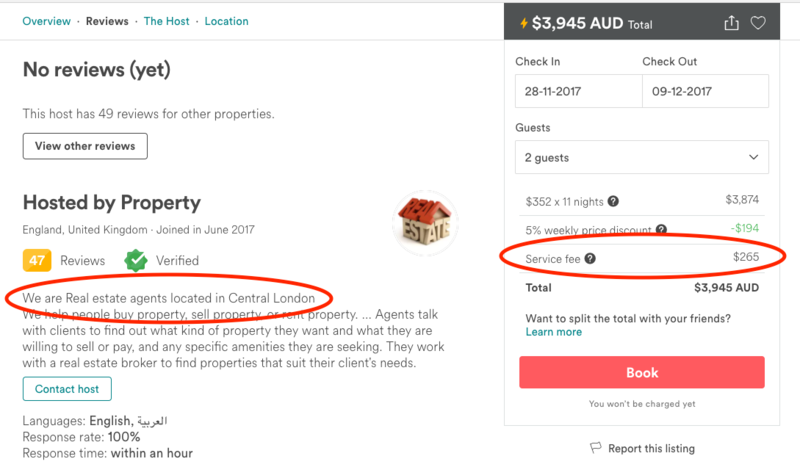 I love using AirBnb to rent a house from a real person, but often come across properties which are listed on AirBnb by a professional rental agency. In this case you're charged whatever fee the agency is charging the owner, plus AirBnb's fee. Within Australia it's often possible to find the identical house on a rival site such as Stayz.com for the same price, minus the AirBnb fee. Is there a reputable alternative to AirBnb for short-term house rental in London, UK? My searching lead me to Plum Guide, which looks like a slightly more up-market and curated version of AirBnb, aimed specifically at London. It gets some snarky reviews on Trip Advisor (for what that's worth) but they're mostly complaints about how pretentious the company is, rather than the quality of the houses. The company's service fee is bundled into the overall price so it's hard to gauge whether it's comparable to AirBnb's booking fee, but I booked a similar house with the total price being a few hundred dollars less than the price in the AirBnb screenshot above. Edit: I can report that the property we chose is nice, although the Plum Guide hasn't gone to any greater effort than other booking sites I've previously used. The company seems a bit amateurish and doesn't hold up to their own rather lofty ambitions. HomeAway.com is VERY similar to AirBNB. In fact, it looks like they bought the map-based search code from the same place. However, they have MANY listings that claim to be free or a dollar a night with humongous security deposits. Makes me suspicious of the honesty. Not the answer you're looking for? Browse other questions tagged london rental airbnb or ask your own question. Are there metal clubs in London? Are short-term rentals (Airbnb, etc.) legal in Singapore? What differences are there in choosing “This is for business” option in AirBnB?